Sometime around July last year, I got an email from my editor at Fervr. He’d managed to get the site added to several press lists for movie distributors. What this meant was that Fervr was now invited to special advanced screenings of movies, weeks before they are shown to the public. And I got first dibs on all the invitations. Joy! Now while I couldn’t make it to every movie I was invited to (or in one case even find the cinema it was being screened in) I did see a fair few movies last year. And because of these invitations, I was able to see some movies that ordinarily I may not have gone to. Here are my top 5 movies for 2010. I remind you that I didn’t see everything, so there are some absences from this list that might surprise you. For instance, I haven’t seen Toy Story 3 yet. I own it on DVD but haven’t sat down to watch it yet. At this point in time, I am not a parent. I don’t know first hand what it’s like to be a parent. But I do know lots of people who are parents. I’ve talked to them about their kids. I’ve shared meals with them where their kids would sit and eat with us. I’ve been there when times are good and when times are bad. The moments where the parent couldn’t possibly be prouder of their youngen. And times where the parent is literally pulling out their hair in frustrating and wondering about the process of adopting out their child. Parenting can be tough. But imagine how much tougher it would be if the child was a human/animal hybrid that you created in your lab and she was growing at an incredible rate. I know some parents think that their children aren’t exactly human. 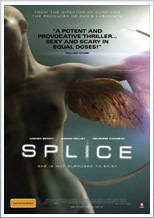 In Splice, this is not an exaggeration but the situation a young couple find themselves after playing God with test tubes.